I am embracing imperfection today. Doing what needs to be done, but not more. Friends are coming over. Sweep up the big stuff off the floor. Don’t mop. Pile the dirty dishes by the sink. Don’t wash them. Take-out fried chicken is just fine. Every meal doesn’t have to be homemade. Outside finishing the chicken coop. Hoping the rain holds off for just a little while longer. Friends and family. Allowing myself to actually slow down, then stop and really feel the contentment. The happiness. Is this what joy feels like? For too long I’ve allowed myself to be distracted by the minutiae of everyday life…and missed the joy. Always seeking perfection and the approval and validation that will accompany it. Striving for that which only I can provide for myself. Change is slow, but good. And today is an accomplishment for me. It’s late at night here at home. The family is asleep or at least quietly in their space(s). I’m wandering through the house shutting out lights and taking an inventory of the weekend’s activity. By the looks of things it was a busy weekend indeed. There is not a tidy spot in the house. We had a big family breakfast and the dishes aren’t done. Everyone was running around doing their own thing so the rest of our meals were “grab and go”. Those remnants and dishes are all over the kitchen also. On the bright side, the fridge and pantry are still clean. I don’t do laundry on the weekend so there is a mountain in the laundry room. It’s difficult to fit an apartment worth of stuff into one room, so my daughter’s stuff is still all over. She’s sorting out the “need now” from the “need later”. Half-empty and half-full boxes are waiting for those decisions to be made. 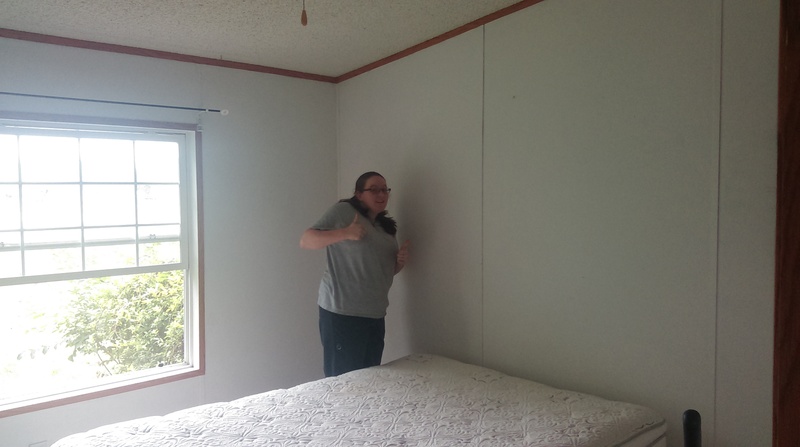 The stuff from the guest room needs a new home as she transitions the room back into hers. She’s working two part-time jobs so progress is slow. In short, there is stuff EVERYWHERE! I figured out a storage solution. We have a storage space in our classroom/studio that will work. It was filled with all the paper documents from our small business. It was moved here when we were still actively involved in it’s day to day operations. Sixty boxes worth. That needs to be sorted into keep and shred/recycle. Right now, it’s stacked everywhere other stuff isn’t stacked, waiting to be dealt with. As you can imagine, there a lots of stacks. It might be more correct to say that there are trails through the stacks. All in all, my home is once again a mess – a total disaster. Boxes everywhere, piled laundry, dirty dishes, stacked counters and tables, messy bathrooms, and an art project or two. Initially, I was upset and frustrated. Then I had an epiphany of sorts. There is a better way of looking at it all. A choice – an intentional choice. Today is done – the end of a good weekend. There is evidence of that good weekend everywhere I look. Meals shared. Creative projects worked on. Memories made. Time together. Everyone is happy and healthy. No disasters or drama. 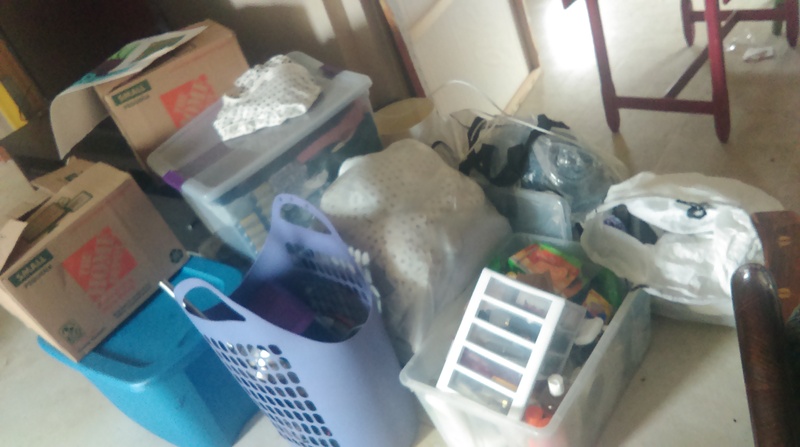 Just a mess – my family’s mess in our home. Could we learn to better pick-up after ourselves? Yes. Should there be less stuff to deal with? Yes. We are a work in progress. I am a work in progress. Tomorrow, I will get up. Start a load of laundry. Make breakfast. Tidy the kitchen. Supervise some schoolwork. Take my son to work. Pick up my daughter from work. Clean a little bit. De-clutter a little bit. I’m going to remember to eat healthy foods and take a walk. I’m going to hug my husband and kids and tell them that I love them. It’s not my purpose in life to clean and maintain a perfect home. Nor is it a priority to de-clutter and have the “right” number of possessions. Those are just tasks towards a goal. A comfortable home for our family to live and thrive and grow in. There is definitely work to be done. But, it will never be “finished”. There will be another meal (and more dishes), a new day (and a change of clothes), more projects (yea, creativity! ), and eventually someone will move out or back in. We will re-arrange, re-prioritize, pursue new interests, change, and grow. It is my purpose in life to love and care for my family (and myself). I also need to make art, but that’s another blog post. As I have been writing this, today has turned into tomorrow. Sunday has transitioned to Monday. Time for reflection makes way for rest…for it is a new day, a new attitude and a new opportunity to make positive changes. Did ya’ pick up your clothes off the bathroom floor? Did that seem like a good idea? Take the trash out – NOW. If you don’t pick up your room now, I’m coming in with a trash bag. Go do your math – NOW. There is more, but you get the general idea. So, this blog is fun for me. I get to remember that I actually did go to college, am educated and could converse in a pompous manner if it is ever required again. I am flexible. I have a revered reverend friend who pondered yesterday about why the word “behold” has fallen out of use. I pledged to use the word today…so here it is. Basically it means to see with attention, to see clearly, to direct the eyes to, or fix them upon an object. And somehow that totally fits with what I am thinking about today. I love it when those mysterious coincidences happen. I suppose that when you behold something it seems to happen in an instant…Wow, look at that! I am suddenly seeing that for the first time. Amazing! Sure, the actual seeing happens that quickly. But, what groundwork was laid before. What brought you to that moment when you were able to behold? When the realization and recognition were possible? Take, for example a seed. It’s tucked safely in a seed package. There’s a picture on the front of the package, a promise of what’s to come if, and when, that seed reaches it’s potential. You see the picture. But, a lot has to happen to that seed for growth to occur. Work has to be done. The seed has to be planted and watered and have the warmth and light of the sun. And it has to change…to be damaged in a manner of speaking. It can’t stay the same. It has to be broken open and exposed for the sprouting to occur. It has to struggle to break free of the confines of the earth that has nurtured it. Yet it can’t leave the earth entirely. It must remain firmly and extensively rooted or it will not thrive. It must continue to grow and branch out in the world. It’s hard work. And then, one day, a bud…a possibility. And then, BEHOLD! A flower, some fruit. It’s not the same as the picture on the package. You saw that. But you can “behold” the actual flower, the fruit. It’s real and you can experience it. Smell it, taste it, touch it! How well does this apply to us and to our lives? To the growth we are striving for? The growth I am striving for…a life lived more intentionally. Potential realized. Filled with peace, joy, love and creativity. The promise of the seed is never realized in the package. The potential of the seed is merely an image. I want to rip open the package, to break open and strive and grow…to bear bountiful fruit. And I am afraid of it. The choice is – to look or to behold? It’s not a choice you make once and it’s done. The choice has to be made over and over and over again. Sometimes daily, more often moment by moment. A rich, full, intentional life is hard. It’s full of mistakes, and do-overs. Lots of learning and frustration. And rewards. Today, I’m going to choose to live a life that can be seen clearly. Behold! I just love the word “ginormous”. So I figured out a way to use it in a really long title today. What I’m really thinking about today is change. Some folks say that all change is good. Some of us greatly fear it. Most of us resist change. I struggle to be at peace with it. Regardless of how anyone feels about change or how hard we try to stop it, change happens. And thank goodness for that. I, for one, am a big fan of the wheel, written language, electricity, air-conditioning, pre-stretched canvas, and that I don’t have to wear a corset or hoop-skirt. Cake mixes also. Not everyone will agree on the cake mix thing, but they’ve never tried my scratch-made cakes. Nobody has. Because I’ve never made one. Honestly, I don’t even get the box mix thing. My grocery store’s bakery does an excellent job. Why strive to achieve out of my comfort zone? But my Mom thought the boxed cake mix signaled the end of civilization as she knew it. She refused for the longest time to use one. She didn’t actually like to bake all that much though, so we just didn’t have cake. My youngest child doesn’t even realize that there was a time before boxed cake mix…and can’t comprehend a time before electricity. The power went off the other day, and she just about lost it. Life was over as she knew it. You can run from it, ignore it, and try to stop it. You can yell at it and everyone who is trying to promote it. It’s called history…and the future. Instead of trying to stop that ginormous rock of change from rolling downhill – get out of its way, ’cause it’s not going to stop. Take a picture of it if you need to . Then you’ll have something to look at and remember the time before the change. You might be shocked and a bit bewildered to find that you survived it and that the world did not end. You might even come to like it (or at least tolerate it). I don’t think that change, in itself, is either good or bad. It just is. Change that benefits me, may not be so great for someone else. A change that you desperately hope for, may adversely affect others. The Dark ages came and went. Yea for the Renaissance! World Wars – not so great. Peace – awesome! Lessons are learned. Newborns are amazing, but not forever (I like to sleep). Toddlers can be fun. Then they toddle on to the next stage and we are grateful and a bit sad. I grow older – and hopefully, wiser. Perhaps one day, we will all become wiser. And, realize that fear and yelling and fighting do nothing to change things. The change is unaffected by our fear. That big ole’ rock keeps rolling. Maybe love is the only answer. Love those who are fearing the changes. Love those who are hurt by the changes. Love those who are working hard to change things for the better. Love those for whom change is not coming fast enough. Our dog, Daisy, died yesterday. I never got the attraction of dogs until we found each other. 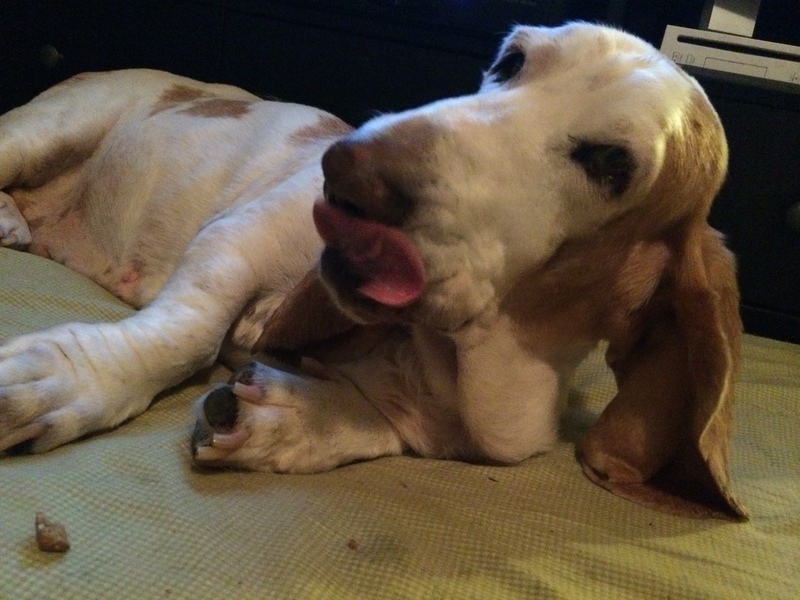 She was a rescue basset and had been found abandoned in a downtown park. She was probably confined in a small kennel most of her life in order to birth litter after litter of puppies. Then dumped when she was too old to be profitable. She introduced herself to me by shuffling up to me and plopping her considerable weight on my feet, rolling over and presenting her belly for rubbing. She had a large whooping bark whenever she felt the need to call attention to herself. She was happy in the here and now. As her dementia worsened and she became incontinent, irritable and disoriented, she taught me about love. The need to love the sometimes unlovable. To love her for what she had brought into my life. To see past the behavior and to love the whole being…to love Daisy in the here and now. To love her because she is a living being that is deserving of love simply because…not for what I might get out of it, but for what she needed from me. Love is rarely 50-50. If I’m keeping score in a relationship, it’s not love. But, now I say goodbye to one of my greatest teachers. I hope I can remember the lessons learned and use them well.